Crocodile Mick's Darwin is a local crocodile producer and manufacturer of crocodile products and crocodile Taxidermy. Mick Pitman has been in the industry for 30 years now and is the only producer in Australia that using natural bush barks to tan his crocodile skins. All our products are exclusive crocodile products that are hand crafted and hand stitched. 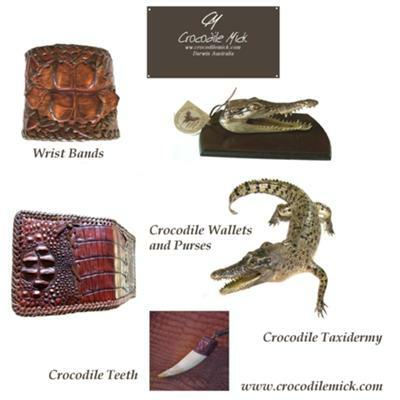 Crocodile Taxidermy: - all size crocodiles along with wallets, purses, handbags, and wrist bands and crocodile teeth necklaces. Call us we will be happy to assist you. I brought some items from Mick Pitman Crocodile Mick and he is indeed the best at this trade I have ever seen. Keep up the great work and thank you!!!! Great Job! best crocs I have seen, real quality!